One thing nice about having a FB Page is definitely the ability to post real quick updates, right on-the-go, from my iPhone. 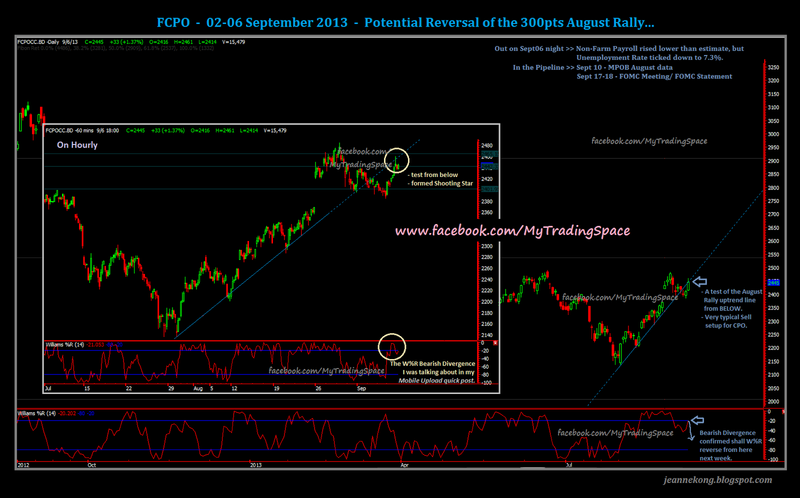 And then on Sept06 (Friday), also outside running some errands, CPO finally gave some indication of where it really plan to go, in the late evening trading. Another simple yet informative post on CPO, though the mobile app (provided by NextView) doesn't have an option for adding in Oscillators. 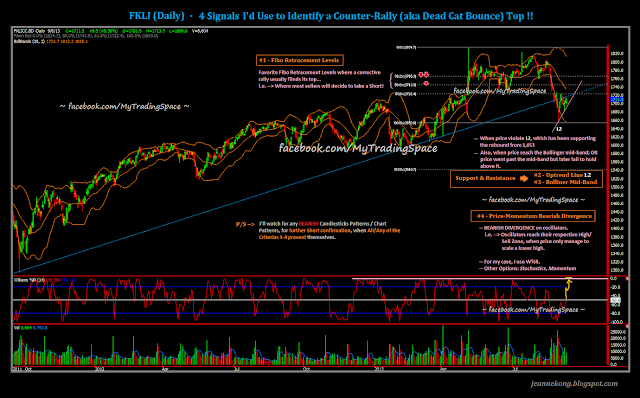 The bearish divergence signal was later verified, after I reached my destination & run through the full chart on my laptop. The Long setup did realized the day after I posted my sketch. It's looking more & more likely for an Inverted Head & Shoulder neckline breakout on FKLI ! 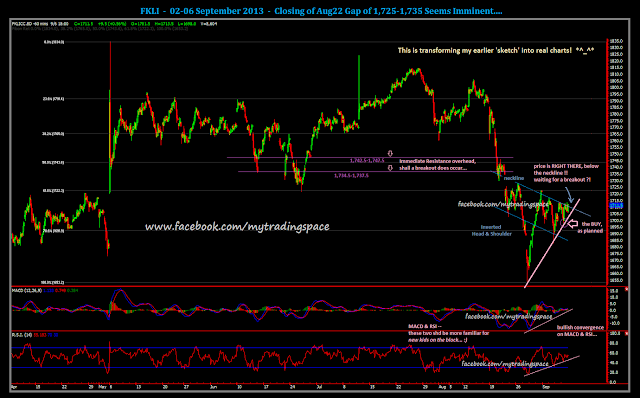 That's equivalent to saying that the Aug22 gap at 1,725.5-1,735.5 is about to be filled, shall the neckline breakout does occur in coming week trading. Now, here's like putting $$$$ into your pocket!!!!! We might be nearing an end to the fantastic 300pt August rally...As noted in the mobile post above. Do note though, that the MPOB August industry data is due on Sept10, while the export estimates by ITS & SGS seems to point to a more robust export demand throughout August month. That's the potential risk to my short. 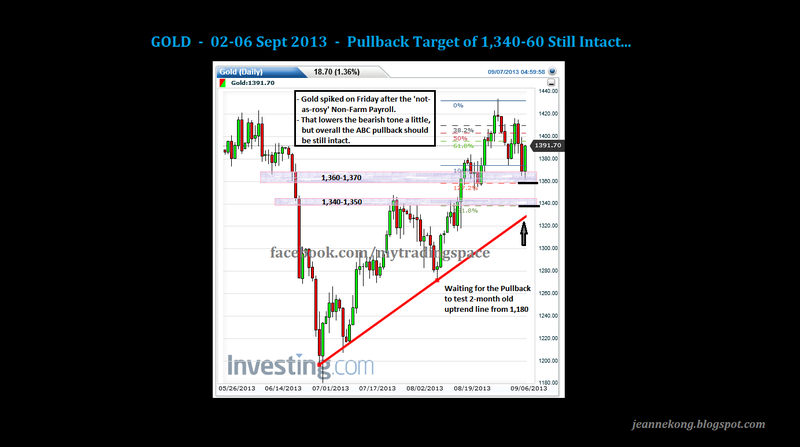 Well, GOLD was on a very nice ABC pullback from $1,433.50/ounce high made on August28. The NFP out was less bullish than expected, but overall still show a rise mom. Unemployment Rate (UR) ticked down 1basis point to 7.3%, market-bullish. Dow swing from losses to gains, & finally settled flat with a small loss by Friday's close. Market seems pretty divided on whether a less-than-bullish NFP is actually 'good' or 'bad' for market? This may delayed the seemingly imminent QE Tapering, as Fed ponder on the less rosy picture painted by the August NFP numbers. Nevertheless, the UR, which is the one indicator Fed has tied to its monetary policy decisions, gives a better picture, with slow but steady decrease over the past few months. GOLD spiked up after the data, suggesting that traders are more inclined to believe that the data might delay Fed's tapering. Or so we think...?? Anyway, the ABC pullback I mentioned is still intact, based on the charts. So, I'm keeping to my pullback target of 1,340-60 in the mean time, as I expect the price to correct back to the 2-month old uptrend line holding the rally from 1,180 major pivot low. Happy Hunting for September -- It's so volatile! We should stay cautious & just Aim for the Big Money $$ ! !